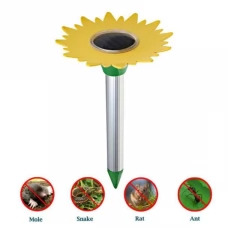 Outdoor Solar powered sonic pest snake repeller with LED light is an effective deterrent device in expelling snakes and other cold-blooded creatures, underground pests including rodents like mice, rats, moles etc. 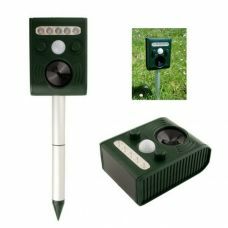 Completely energy independent and waterproof electronic repelling item utilizes sonic waves to protect a home, garden, yard, farm, parks and any other outdoor areas all the time. The Outdoor Solar powered sonic pest snake repeller with LED light is effective at repelling snakes, mice, moles and other rodent and pest by emitting a sonic pulse which critters feel as a vibration transmitted through the ground. It is a dangerous signal for rodents and causing them to evacuate the area. 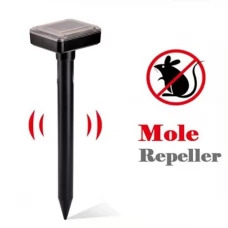 The Repeller transmits its signal in all directions to about 15 meters, so the Product can be placed around 30 meters apart in high-risk areas. However, to get the best results it is recommended to use two or more units. The Solar Power module charges the battery during the day, and runs the Repeller, while night-time operation is enabled by the battery. - Effective within an area of up to 650 square meters. - Two LED Light modes: keep lighting and flashing (every time for 30minutes). 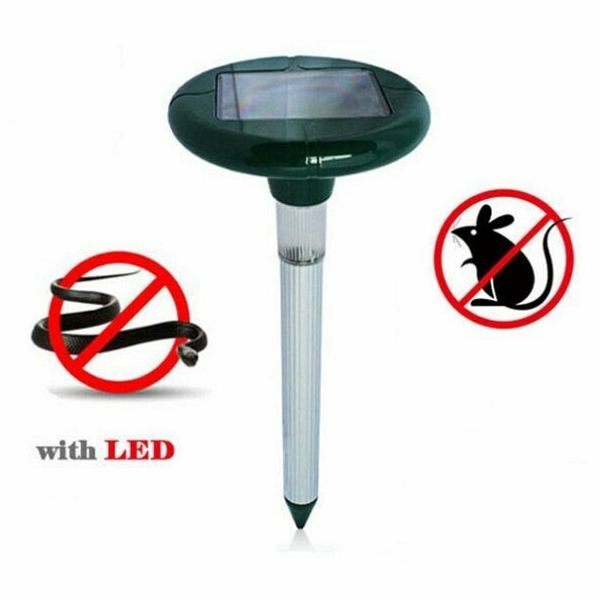 - The Light Sensor Turns the light On automatically at night. - The light can work up to 8 hours at night after a full sunny day charging. - Highly efficient battery. Its battery can store enough energy to power the repeller for several days of little or no sun; in some cases up to one full week. 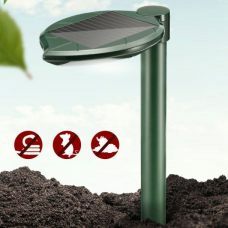 The product is suitable for any outdoor areas with direct sunlight including a home with surrounding area, patio, porch, garden, backyard, larger areas like farms and crop fields, parks etc. 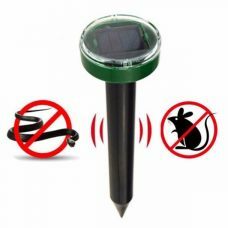 1 x Solar Power Pest Repeller. 1. Unpack the product completely to make sure all parts are present. 2. Connect the repeller’s head, pole sections, joining part and ground stake together. 3. Turn the power switch to ON position. The product designed to be switched ON all the time. 4. The product is now ready for installation. Place the device in a required area under the direct sunlight to keep the batteries fully charged. Make sure that the repeller is located at the right place within the effective expelling range from the targeted area. 5. 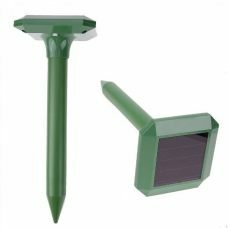 Keep the solar repeller’s head about 9-10 inches above the ground for the best effect. 6. Install the device on the ground with care to prevent it from breaking against the hard ground. We advise even to prepare the ground for the ground stake to avoid damages to the item. Be careful with the sharp end of the ground stake. 7. Leave the product to allow it to operate automatically. 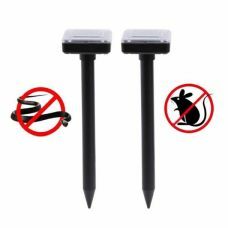 Disclosure: please note that Sunny Bunny Solar Power Store as a retail entity is unable to sufficiently test and assess the product’s features and only advertise characteristics of the products provided by suppliers. We recommend our customers to do their own research to find out whether products suit the desired purpose. 1. The Product is weather and waterproof, however, it is recommended to remove it under extreme weather conditions such as hail, flooding and snow. 2. Please be careful when removing the Repeller from the ground. Do not break the connecting wires. We recommend to unplug it before removing the spike from the ground. 3. After some time the battery may start to lose efficiency, so we recommend to replace it with another complect. An AA 1.2V Ni-Mh rechargeable battery is recommended. 4. 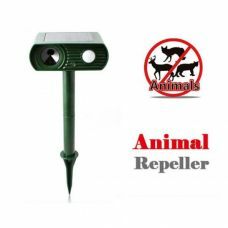 To get the best results, Animal Repeller should operate continuously. 5. Do not immerse Animal Repeller in the water. 6. For cleaning Repeller use a damp-soft cloth and mild soap with water. Do not use harsh chemicals or abrasive cleaning agents that may damage the repeller.